The former St. Francis hotel on Wednesday evening. What are the chances of a successful hotel being developed in downtown Albany? Conventional wisdom says zero to none. But maybe the conventional wisdom is wrong. And come winter, business students at the University of Oregon will try to answer the question in a systematic way. The city of Albany has formed a partnership with the “Sustainable City Year” program at the U of O. The program calls for students and faculty in several disciplines — from architecture and business to geography and public policy planning and management — to tackle 21 problems or issues of interest to the city during fall, winter and spring terms. About a 103 years old now, the St. Francis building at First and Ferry is owned by the Pride Printing Co., which occupies the ground floor. The top three floors of the four story-building have been largely vacant since the 1960s. Every now and then, people who think about such things wish that the building could be restored, either as a hotel or something else that would bring more people downtown. 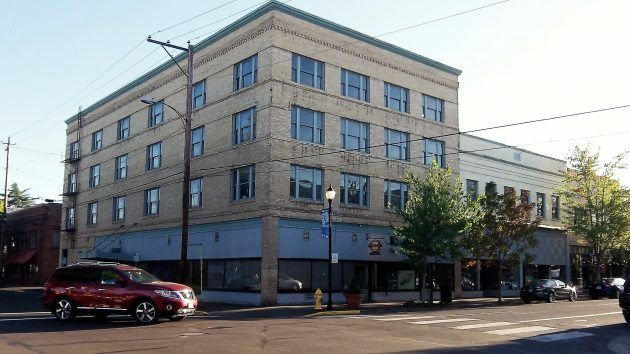 About 2010, Innovative Housing Inc. of Portland wanted help from the downtown urban renewal district to buy the building and renovate it for “workforce housing.” The city said no, and later the company instead got city and state help in building Woodwind Village, which replaced an old trailer park on the east side of the urban renewal district. Two years ago a team of architects and historic preservation specialists looked at the St. Francis again. They concluded that the “most viable uses include commercial suites on the ground floors, with hotel and/or market rate housing on the upper floors.” They also estimated that fixing up the building would cost roughly $10 million or more. It’s hard to imagine that somebody with tons of idle money lying around would want to spend it on the St. Francis. If you had that kind of money and wanted to have a hotel downtown, you’d more likely pick out a vacant lot or two and build a structure with a modern layout and efficiencies inside a historic-looking shell. Saving the St. Francis and turning it from a relic into a living landmark in a thriving downtown would be a huge achievement. As far as I can see, only the Albany Revitalization Agency and its district (CARA) are in a position to consider doing so. To get started, CARA would have to acquire the building and then go from there. That is SUCH a wonderful idea! I couldn’t be more supportive for this to happen! I would love to have more info on this as it progresses. This could be one more step closer to rejuvenate the core area in Albany. I hope there are some forward thinking people here that feel the same! Someone should talk to McMenamins. They seem to be able to take a sows ear and turn it into a silk purse..
McMennies….or better yet ….maybe an “up-and-comer” of the same brew, eats & hotel establishment type! $10 million is a big ouch. It also means a lot of work. and probably a lot of seismic reinforcement, is needed. Fresh minds might come up with something. The hotel is so beautiful on the inside. I really hope someone does a proper restoration job someday before it is too late… But yes, it will require big $$$$, more than I have in the bank. Push it over and haul away the rubble. Sell the land for dollar and you’ll see interest sparked.